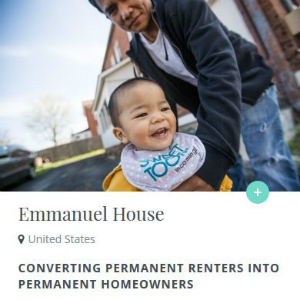 NOTE: IN APRIL 2018, AS PART OF ITS CONTINUING COMMITMENT TO HELP BREAK CYCLES OF POVERTY, EMMANUEL HOUSE MERGED WITH A LONG-TIME PARTNER ORGANIZATION TO BECOME THE NEIGHBOR PROJECT. THE STORY BELOW REMAINS ONE OF THE HIGHLIGHTS OF EMMANUEL HOUSE’S HISTORY, AND WE HOPE YOU READ IT, BUT PLEASE ALSO READ ABOUT ITS NEW AND MUCH-EXPANDED CAPACITIES AS THE NEIGHBOR PROJECT H E R E .
EMMANUEL HOUSE has been named one of the Top 100 Most Innovative social enterprises/non-profits in the world by Classy, the great funding platform that has helped raise hundreds of millions for social change organizations. The “Classy” has become the “Oscar” of the social change world. Congratulations to Rick & Desiree Guzman, who founded Emmanuel House as a living memorial to Bryan Emmanuel Guzman, to our Executive Director Hayley Meksi, and to all our friends, supporters, and network partners. Go here to See the Top 100 and be inspired by what each one does. Emmanuel House is honored to be in this company. 1300 organizations operating in 118 countries applied for these prestigious awards. The webpage introducing the Top 100 says: “The Classy Awards exist to put a spotlight on the most remarkable change makers of our generation. The Finalists recognized this year are addressing the incredibly complex and equally severe problems we face today. Their efforts span global poverty and hunger, disease, education, climate change, disaster response and preparedness, and health care accessibility. Kate Brandt, Lead for Sustainability, Google… and many more you can read about Here. We have to say again that Emmanuel House is so honored to be included in the company of this year’s Top 100 and all of Classy’s clients. Emmanuel House has come a long way and has a vision for a future filled with even more hope for more people. ♦ Go to the Emmanuel House main page on this site, which contains links to the Emmanuel House website where you can donate, volunteer, and invest. ♦ Go to the Social Change main page where we highlight other organizations and initiatives trying to make a difference. 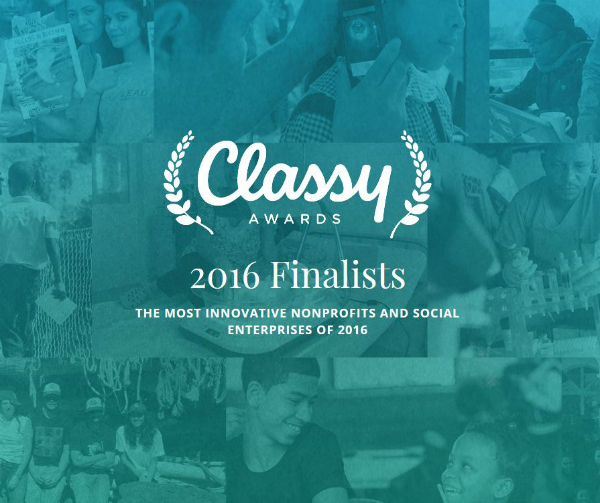 This entry was posted in Social Change and tagged 2016 Classy Finalists, Classy, Emmanuel House, Fast Company, Rick Guzman. Bookmark the permalink.